Image Engravers - Welcome to Image Engravers! Are you looking for a special gift for someone or possibly a customized award or plaque? 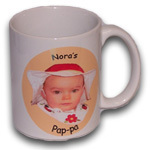 How would you like to put your own image on any one of a number of different items for that special someone? We specialize in custom engraving and dye sublimation projects. Each item is handcrafted with the highest quality care. Select from name badges, t-shirts, cutting boards, mugs and many more items. Start browsing for ideas by choosing one of the categories to the right. No job is too small. Contact us for more information.